Another Friday & another day closer to Christmas! Patrick and I scooped up this fun Countdown to Christmas Santa at Pier 1 the other week and I might get a little more excited than I should to move the marker each day. Just a little bit. I might not be able to remember to water the plants at our house on a regular basis, but I can definitely remember to update the countdown. Linking up for another Five on Friday with April. I went and checked out the JLC Holiday Market at the State Fair Grounds this past weekend for the first time since I was maybe 12. It's a pretty neat show but the highlight of it for me was finally purchasing a necklace from LauraCoxDesigns. Plus, I got to meet Laura which was really nice. It's always fun when you eventually get to meet that other blogger that you've read along with for years! Ugly Christmas sweaters, good friends, and a Friday night. 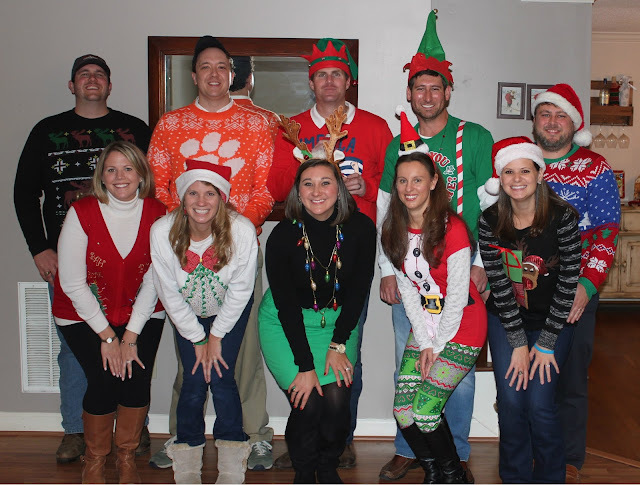 Last Friday, our friends Chris & Sarah hosted us at their house for an Ugly Christmas Sweater Oyster Roast. We had so much fun, especially in our sweaters that Patrick scooped up at Walmart two hours before the party. We sent out our very first Christmas cards this week... I've been waiting oh so patiently for this Christmas so that I could send out our first official card. I absolutely love how they turned out! They've all been so good and easy to make for what's turned out to be a unexpectedly busy week for us. If you're looking for dinner ideas, check one out! Especially that Honey Sesame Chicken. If you decide to go with that one, double up on the recipe for the sauce. Trust me. You didn't really think that I was going to get through an entire post with no mention of Clemson, did you? Of course not. I wasn't going to forget my ACC Champions! While they don't have another game until New Year's Eve, we will be watching my favorite #4 tomorrow night at the Heisman Ceremony. He didn't take home the hardware last year and he likely won't again this year but it's awesome to see him being honored as a finalist. Don't worry. I still have my fingers crossed that he comes home to Clemson as a Heisman winner! We had spaghetti and meatballs this week and it was SO delicious--I love comfort food like that. Your santa countdown is adorable!!! I want to marry my crockpot - definitely trying out your dishes!! Also, lol, I thought about you when I read The Skimm this week and it said something like "If you know any friends who went to Clemson, they're busy on NYE" :) Loving the sneak peek of your holiday card! That necklace!!! (Insert lots of heart eyed emojis). It reminds me of how Kendra Scott started out. I use to go to markets that she had little booths set up at and got to meet her in person. Ugly Christmas sweater parties are my favorite. Hope you have a great weekend. That countdown Santa is the cutest! We're been hooked on crockpot meals too! Ugly sweater parties are the best - our friend usually does one but this year its Christmas pj's which I don't hate either! Mmm white chicken chili! Perfect cold weather food! Happy Friday! I have a Laura Cox necklace too and I love it! So fun that you got to meet her :) Love a good Ugly Sweater Party too- so fun! Have a fabulous weekend! Haha, I love that you remember the Santa, but not necessarily the plants - that's so me too! Your necklace is super pretty! !